Poll: Should Fianna Fáil extend the confidence and supply deal with Fine Gael? The deal is dues to extend after the upcoming budget. Fianna Fáil's Thomas Byrne, Micheal Martin and Dara Calleary. WE’RE THREE WEEKS out from Budget 2019, the third and final budget in the confidence and supply and arrangement between Fine Gael and Fianna Fáil. The agreement means that Fianna Fáil essentially facilitates the passage of government budgets by abstaining in the Dáil votes on them. The same is the case in no confidence votes. Fianna Fáil argues that the deal delivered a functioning government after the unclear 2016 election result and also allows them influence government policy without being in coalition. Sinn Féin and other parties have criticised their stance in facilitating the Fine Gael government. 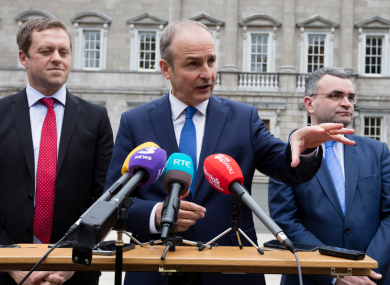 But while the agreement looks to have held for its agreed duration, there is considerable debate in Fianna Fáil as to whether they should extend the deal. Not doing so would mean a general election. Today’s poll: Should Fianna Fáil extend the confidence and supply deal with Fine Gael? Email “Poll: Should Fianna Fáil extend the confidence and supply deal with Fine Gael?”. Feedback on “Poll: Should Fianna Fáil extend the confidence and supply deal with Fine Gael?”.